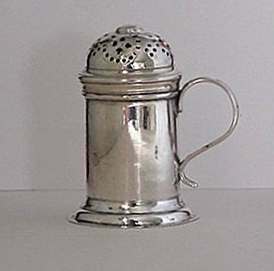 The English sugar caster was invented in the reign of Charles II and by the end of the 17th century it had been joined by pairs of smaller versions, made to match, whose purpose, it is believed, was to dispense pepper and cayenne. However by the early 18th century quite different vessels for dispensing pepper had come into use and, as they did not take the place of the caster but were used in parallel with it, there is something of a mystery surrounding them. These new vessels originally took two forms, the kitchen pepper and the bun pepper but by the end of the 18th century these had been joined by a third; the muffineer (also spelt muffinier). Although these vessels are casters of a sort, they do not follow the evolutionary patterns of 18th century casters and their use, as distinct from casters, has not been definitively determined by modern historians. Of the three, muffineers are the most enigmatic and indeed may not exist at all as something different from a caster. It is common to see a lot catalogued by an auctioneer as a muffineer when it would appear to be nothing more nor less than a caster and it is difficult therefore to determine exactly what a muffineer is. I once challenged an auctioneer on this having seen apparently identical items in his catalogues listed in one as a caster and in the other as a muffineer. His answer was that it depended on the size but when pressed on this he was unable to specify a size for either and I was left with the impression that it all depended on how he felt on the day! Charles Oman, in his description of casters makes the following statement: "Large casters are frequently referred to as dredgers and small ones muffineers. The latter term appears to be considerably younger than most of the objects to which it is applied"(note 1). There is no mention of the muffineer in the Miller's Dictionary of Antiques, neither does it appear in the pages of the English Universities Press Dictionary of Antiques. The following entry does appear, however, in an old copy of Chambers Twentieth Century Dictionary: "a dish for keeping muffins hot: a metal cruet for sprinkling salt or sugar on muffins". I have come across the former in connection with the early 19th Century habit of eating muffins. It was a flat dish with a domed cover made of either porcelain or silver and was designed to keep muffins warm at table. The definition given in An Illustrated Dictionary of Silverware by Harold Newman suggests "A type of small caster.....domed cover pierced with small circular holes......the lower part sometimes has pierced decoration and is provided with a blue glass liner" (note 2). This latter is referred to on page 131 of Three Centuries of English Domestic Silver 1500 -1820 by Bernard and Therle Hughes (note 3). I reproduce the reference here in its entirety on the understanding that it may have some relevance. "Toward the end of the eighteenth century when it became customary to sprinkle cinnamon on hot buttered muffins, small casters were used, of spice dredger size but without handles. These were known as muffineers. The majority were vase-shaped, never more than four inches high, with low-domed sprinklers drilled with fine circular holes. 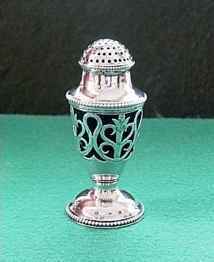 The bodies of eighteenth century examples might be embossed or engraved: later they were seldom ornamented. Another series of muffineers had their bodies fret-cut in the neo-classic style and contained liners of blue glass. These usually had narrow bands of strengthening moulding encircling their bodies a little below the middle, and plain moulded bases". Although the spice dredger is mentioned in this reference I have not come across one of this period and feel it likely that if spices were used at table then casters would have been made to accommodate them designed to match the casters of the time and this patently did not happen. The likelihood is, in fact, that the reference is to kitchen peppers. Sir Charles Jackson records a muffineer as having on it the maker's mark of Richard Gurney and Thomas Cook which they registered in 1734 but as I can find no other references to muffineers at this early date my opinion is that Jackson�s terminology is ambiguous and that the vessel in question was probably a caster. There is a reference in Parson Woodforde�s diary for the year 1788 which reads "Mr. Du Quesne made me a present of a small silver muffineer this afternoon" (note 4) and this, because of the use of the word 'small', suggests something of the 'dredger' sort mentioned above. 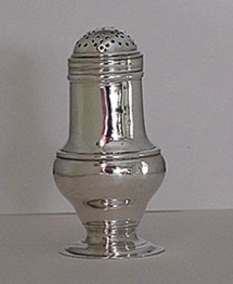 It seems that at the end of the 18th century and throughout the 19th muffins were eaten with cinnamon, salt or sugar sprinkled on them and for this a small vessel was used of a size which at the beginning of the 18th century would have been called a kitchen pepper and in the 19th century would have been known as a pepperette. Marking is under the foot and the tops are usually unmarked. These small vessels are often called muffineers and have been given no other nomenclature. I have seen an advertisement by Mappin & Webb said to be dated 1894 which reads: Two Sterling Silver Muffineers, Fluted, in rich Morocco Case, lined Silk and Velvet, complete, �2-5s. The picture showed a pair of "casters"! Bun peppers on the other hand have a much more solid historical background although they, too present something of a mystery. They were produced during the reigns of Geo I and Geo II, are usually of baluster shape and, although they vary in size, can be virtually the same size as a caster. The obvious difference in appearance between the bun pepper and the caster is that instead of a high domed perforated top surmounted by a finial these vessels have low domed tops, usually pierced with simple holes and have no finial, hence the term "bun" pepper. On close examination it will be found that the top, instead of being secured by means of a push fit sleeve which slides into the body of the vessel, as with casters of the period, fits over the body but again as a push fit. Marking is underneath and the tops are often unmarked. When they are marked just the sterling lion is used and is punched actually inside the top so that it is usually quite difficult to read. It would appear that these items were sent to 'Hall' for marking before the holes were drilled in their tops and thus the marks were drilled through. It should be noted that tops of bun peppers should always be thoroughly examined in order to 'find' the mark as a marked top makes the item worth more than an unmarked one. The mystery is; what were bun peppers for? They do not match contemporary casters and yet they can have a similar capacity. They must have been used at table but were they, perhaps, for less formal occasions? All that can be said of them is that they appear to have been made singly and are usually undecorated except, on occasion, for armorials. The kitchen pepper also presents a puzzle with regard to it�s place in the range of domestic plate. It is difficult to know why a gentleman would provide a vessel in sterling, or even Britannia, silver for kitchen use especially as they are not of a size which would be of much use in preparing large quantities of food. Pewter would be much more suitable for this purpose! Like the muffineers described by the Hughes' in their book mentioned above, they are not more than four inches high and usually much nearer three so that their size would suggest that they were for table use and yet we already have the anomaly of the bun pepper in this connection. The Hughes' suggest that they may have been spice dredgers but I feel that if spices were used at table, other than the peppers mentioned in connection with casters, then additional casters would have been produced to match existing ones. Were they, perhaps, intended for use by the senior staff in the "big house" or possibly only at the breakfast table? These rather charming little vessels were produced, like bun peppers, during the first half of the 18th century and like bun peppers they are usually undecorated. They are simple in construction being nothing more than a cylinder standing on a raised foot with a simple "S" or loop scroll handle soldered to one side. The perforations in the push fit top are often just drilled holes in a low dome although some, as in the one illustrated here, were also given a little of the more ornate piercing of the sort found in long tea strainer (mote) spoons of the period. This top is almost always without embellishment although examples with finials are not unknown and the slightly more ornately pierced ones may have small bun-like additions at their highest points. Marks will be found on the body or under the base depending on date (Queen Anne=body and Geos I & II=base). As with bun peppers tops fit over the body and are often unmarked. Although the term "kitchen pepper" suggests a humble object they are not as plentiful as might be expected and they are, therefore, relatively expensive. To sum up; kitchen and bun peppers were produced during the first half of the 18th Century, though later examples can be found, and are very much less formal than casters of the period. It is difficult to know exactly how they fitted into the range of household plate and indeed exactly how they were used. Muffineers apparently did not appear until the end of the 18th century and may, in fact, have been casters in all but name. It is a fact, however, that the small vessels with the blue glass liners which appeared at the end of the century do pre-date pepperettes which did not come on the scene until the 19th century. These may therefore be true muffineers. They were used to sprinkle salt, sugar or cinnamon on muffins.